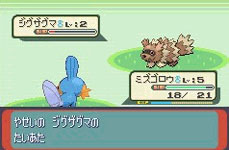 From the outset, the graphical upgrade to the Pokemon series is apparent in Sapphire and Ruby. Though this isn’t a visual wonder like Super Mario Advance 3 (the Super Nintendo’s Super Mario World 2: Yoshi’s Island) it is substantially ahead of the previous Pokemon game, Crystal. There is much more movement on the screen and the colors are much brighter. Anyone familiar with the old Pokemon games will be pleasantly surprised. However, with games like Metriod Fusion and Kirby looking incredible, Sapphire and Ruby look somewhat primitive. The game starts out with a quick intro and a title screen. After the title, the game will ask whether you want to be a girl or a boy and then ask you to choose a name. After this, you will wake up in the back of a truck; its moving day and you’re coming along with the furniture. You will end up right outside of your house - when you go in, you can set the time, meet your mother, and see the Machop Moving company. Inside your character’s town you can meet your rival. After meeting him or her, you can go into the tall grass where you will see the game’s Professor being attacked by a dog Pokemon. By grabbing his bag you can choose one of three Pokemon to attack the dog Pokemon with. When you win (and you certainly will; the Professor’s Pokemon are much stronger than the wild dog) the Professor will take you back to his lab and reward you by giving you the Pokemon you chose. The two games, Sapphire and Ruby differ far more than the previous games did. Not only are the Pokemon you meet (and can catch) different from game to game, but the plot changes slightly in each game. In Sapphire Team Magma is trying to capture the game’s legendary Pokemon and you have to save it. In Ruby you have to stop Team Aqua from taking over the world. Trainers are placed in different spots in each game as well. 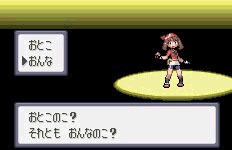 Though not available in the beginning, Sapphire and Ruby also feature two on two Pokemon battles. You can call out two Pokemon at a time as can your opponent. It’s an interesting new dynamic to the tired and true formula the Pokemon series has been using since the Red and Blue games. As for the Pokemon themselves, 100 new critters are added to this set of games, making a total of 351. The character designs continue the very Japanese trend that the new Pokemon of Gold and Silver started, which amounts to the Pokemon looking very unusual, but charming (for the most part, anyway). Sapphire and Ruby are firmly rested in the previous Pokemon titles. However, they add enough new features to reignite old fans' interest and attract new players to the Pokemon franchise. 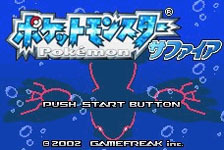 The games were released on November 2002 in Japan, though no concrete date has yet been set for the game’s U.S. release. However, American gamers can rest assured that Nintendo will bring their cash cow Stateside.